When Lui Tuck Yew decided to quit his post as Minister of Transport and withdrew himself from any future involvement in the government, he probably found out what Khaw Boon Wan found out today. While Lui did not wait for things to happen before he resigned, Khaw had no choice but to put up with the furore of public angers following almost daily train breakdowns culminating in a train collision that injured 29 passengers and staff. And Khaw minced no words when he pointed out at the systemic and cultural faults in the original planning of the whole MRT system. Which means that you can keep on changing Transport Ministers or SMRT CEOs but the result is the same - more breakdowns from virtually unknown or unheard of sources. It's like a lottery game. If you look closer at the issue, both Lui and Khaw were in the Transport Ministry for too short a time to be blamed for any major decision-making by them that results in the disastrous rail system. They were merely put there as scapegoat to be slaughtered by the public. 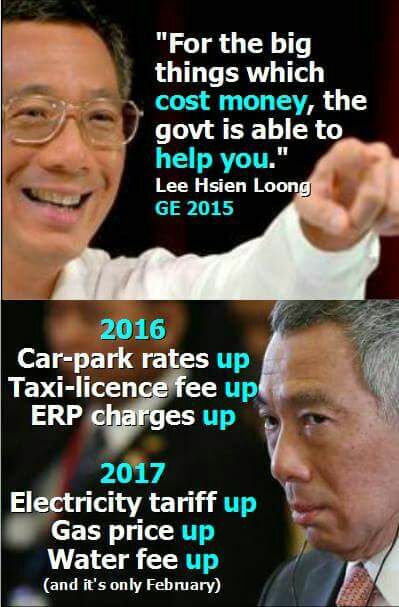 During his press conference Khaw shed some light into something we can only guess, but now it is from the horses' mouths. He mentioned in no uncertain terms that the lack of funding from the govt, resulting in cost-cutting measures, which in turn leads to cutting corners are the root-cause of today's public transport problems. 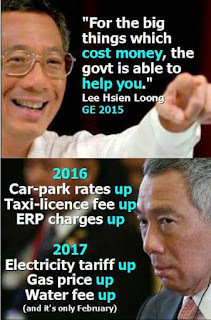 This culture of cost-cutting versus the cost of everything else started during the reign of Lee Hsien Loong as the Finance Minister, who is keeping very quiet now. He is the one who approve or disapprove these spendings. And during those days, his culture is based on profits. For every dollar he spent, he wanted to earn back another dollar more. Which means, if he approves the building of a new MRT line, SMRT must provide proposals to earn back double the amount spent over say, a 10 year period. SMRT need to work with other agencies to come up with proposals that include building HDB clusters around new stations to maximise flow of commuters, setting up of shopping malls and renting of space to retailers at MRT stations. So the emphasis is not on providing the public with a high quality, high standard, long-term viable transport system, but one that will generate maximum profits as soon as possible. The results of this culture is showing now. Low quality, understaffed, poor workmanship and sloppy maintenance resulting in even more breakdowns from the already overloaded trains and tracks. The man responsible for this debacle is keeping very quiet, because he doesn't want this to affect the next general election's results too much. He leaves it to the scapegoats (whoever they might be) to take the bullets, while he plays the good guy out to help you out of your troubles. He has difficulty doing this now with the MRT, with the constant breakdowns. Who knows this gutless man better than his brother and sister? His siblings already warned Singaporeans of the danger of their gutless brother, who will not hesitate to abuse his power to get what he want for himself. A leader who truly think of the helping the people and the country, would not care too much about his salary, but this man insist on paying himself exorbitant remunerations (see chart taken from a forum, below). And this amount exclude the 12-month bonus he is rumoured to be getting every year. And the lame reason given is he should be paid like a CEO. 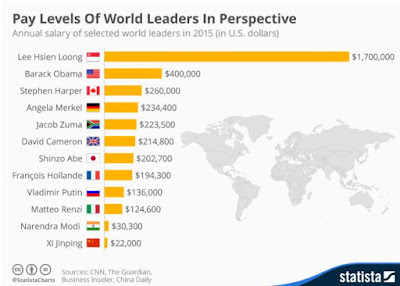 He can't be earning less than his CEO wife from Temasek, can he (irrespective of his job role)? We also saw with our own eyes how he manipulated the Elected Presidency to get his choice of President in the Halimah saga. Judge a dog by how it wags its tail, and not by who its father was. He (or his culture?) is going to be the root of all of Singapore's future troubles, and they are coming as regular as Christmas. Spat with China, Oxley saga, Elected President saga, SMRT scandals, etc.